A marked improvement over the already impressive original UAD Fairchild emulation, this dynamic duo hits the spot. Classic valve tones and colours. Smooth compression. Headroom feature to control colouration. Both units run in stereo and mono mode. Subtle tonal improvement may not be appreciated by all. 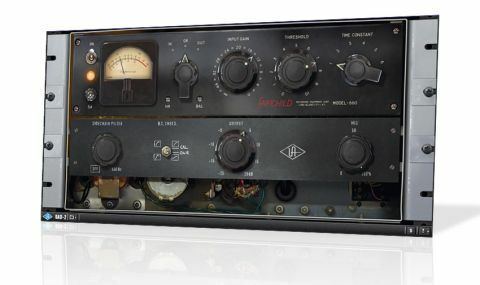 The classic Fairchild tube compressor/limiter was first modeled by Universal Audio back in 2004, but due to the limited DSP of the UAD-1 system and the less sophisticated modeling technology of the day, the transformer and I/O distortion weren't included. This new Fairchild Collection (VST/AU/RTAS) for UAD-2/Apollo comprises new emulations of the Fairchild 660 and 670, as well as the original (now called Legacy) 670. Faithfully modeled on units housed at Ocean Way Studios, these new reproductions employ an up-sampling technique that, while sonically superior, results in greater latency than the Legacy version. "Although the 670 was a stereo unit and the 660 was mono, UA's software versions both work as mono or stereo plugins"
Although the 670 was a stereo unit and the 660 was mono, UA's software versions both work as mono or stereo plugins, depending on what type of channel you put them on. This is definitely a plus, as each model sounds and behaves in a subtly differently way. The 670, however, has additional stereo capabilities, and is capable of mid/side, left/right stereo and dual mono operation. By nature, valve compression is soft-kneed, but the width of the knee - ie, how quickly the input above the threshold approaches limiting - can be controlled using the DC Threshold pots. Additional niceties that weren't found on the hardware include convenient linking of the controls, filtering the sidechain signals of low frequencies for smoother operation, mixing between wet and dry signals for parallel compression, and controlling the output level. Perhaps the best one, though, is the tiny Headroom pot, which lets you control the internal operating range and thus the amount of colouration applied. Apart from the dedicated stereo ones, the 660 has a very similar control set. Both also offer a selection of six preset Attack/Release times, the first four going from fast to slow, and the last two with fixed attack times and automatic release dependent on the envelope of the input signal. The Legacy 670 is a favourite with many producers for its smooth and invisible level control, particularly on vocals and basses, and A/B-ing it with the new models reveals that they're all remarkably similar in that capacity. Where the new ones differ sonically is in their colouration. It's difficult to describe... it's not necessarily "warmth", although vocals seem fatter. You could call it glue, but that doesn't cover it fully either. Essentially, it imparts more fullness, substance and - dare we say it - 3D space. The 670 is the easier of the two on transients, making it slightly more aggressive, while the 660 has more total gain on the input, allowing lower thresholds to be set for more colourful compression artifacts. Each has its own vibe and both sound amazing. The new models look much more like the original hardware, too, and give more detailed control than the Legacy version. Those with good ears will appreciate the broader palette of saturation colours. And if you've had the privilege of using an original hardware Fairchild, you'll definitely get a familiar feeling from this pair, delivering full, assured and musical tones that can ultimately add up to a great mix.